I think I’m being hypnotized by Marisa Tomei’s Alberta Ferretti muumuu. I’m mysteriously feeling a little sleepy. It also looks like she squeezed in the Milk movie premiere between rounds of shuffleboard and taking her bischon frise to the dog groomer. I think my aunt had a similar dress in the 70s made of a completely flammable polyester. 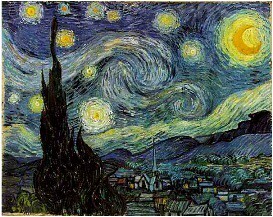 Finally, it also kinda reminds me of Van Gogh’s Starry Night.